Eros International has announced that Producer Salman Khan Film’s Bajrangi Bhaijaan has collected over Rs. 160 crores within ten days of its release in China. 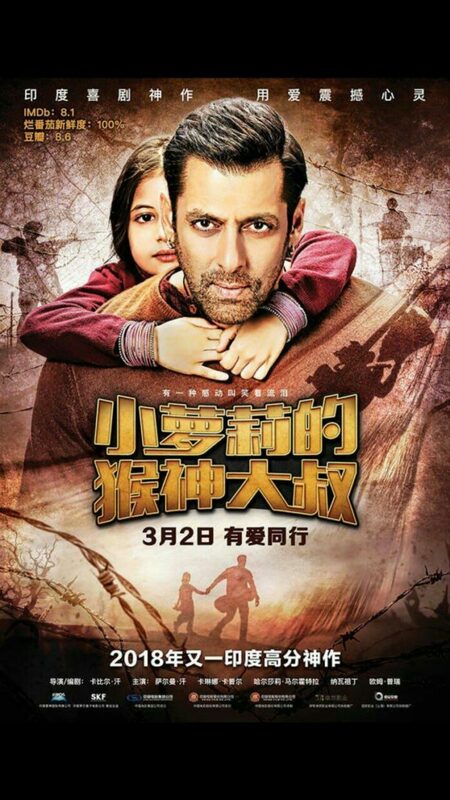 More than two years since it opened in India, Bajrangi Bhaijaan released in China on March 2nd this year and continues to enjoy a very strong box office performance earning Rs. 169.17 crores (USD 25.95 million) since its release. Marking Indian super star Salman Khan’s first ever movie to release in the China market, Eros released the film in association with China’s E Stars Films Ltd and Salman Khan Ventures. After breaking several records during its Eid release in 2015, Bajrangi Bhaijaan crosses another key threshold, with the film taking a commanding start at the Chinese box office, raking in Rs. 14.5 crores on its opening day, debuting at number 7. The Kabir Khan-directed film trended extremely well through its release, climbing to number 4 box office position on its first Monday. It crossed the Rs100 crore mark within a week of release and closed the second weekend with Rs 169.17 crore ($25.95 million) in collections, retaining the number 5 position in the Chinese box office, despite new releases over the weekend. The Indian drama directed by Kabir Khan stars leading Indian film actor Salman Khan as Bajrangi, an ardent devotee of Hindu deity Hanuman, and his arduous journey to reunite a six-year-old Pakistani girl – lost in India – with her parents, back to her hometown in Pakistan. Speaking on the film’s performance, Sunil Lulla, Managing Director, Eros International Media Ltd said, “With the success of Bajrangi Bhaijaan and previous Indian releases, China has emerged as a key market and a major box office earner for Indian releases. We are delighted with the unstoppable run the film is enjoying and how the Chinese audiences have embraced the cross-border friendship story, its emotions, the direction and our much-loved superstar Salman Khan”. “We are extremely encouraged by the success of Bajrangi Bhaijaan in China and very excited about our next to roll Indo-China co-production, once again to be directed by Kabir Khan”, he continued. Here’s some other cool news! With the significant market opportunity in China, Eros and director Kabir Khan are coming together for a travel drama, The Zookeeper (working title) which will be shot in Hindi and Mandarin languages. An A-list actor has been signed up for the project which shall be announced shortly.